As I approached the Locust Street exit off of 280, we saw the long line of cars trying to do the same. It was only 5:45 so I was surprised and disheartened by the crowd approaching the fairgrounds. When I reached the entrance to our usual parking area a sign announced “full lot” and a police officer waved us on by. Although I wanted to continue East on Locust to return home I followed the snake-like line of cars to a parking lot behind the race track. With a stroke of serendipity my sister-in-law was walking up to our car as I parked, she was concerned that it would be quite a distance for Katie to traverse to get to the concert. I acknowledged that it would be a struggle over the uneven terrain of the parking field and stated that after the concert the previous night she was so spent that I had been tempted to pay off some guy in a golf cart to drive her to our car. This night we brought her trekking poles to make the hike easier. Dear, no-nonsense sis-in-law promptly took matters into her own hands and in her new cowboy boots she marched up to a nearby golf cart, within minutes of speaking to the driver another cart arrived to take Katie to the entrance gate where they waited with her until we caught up to help her disembark from the cart. It was a pleasant start to our night. 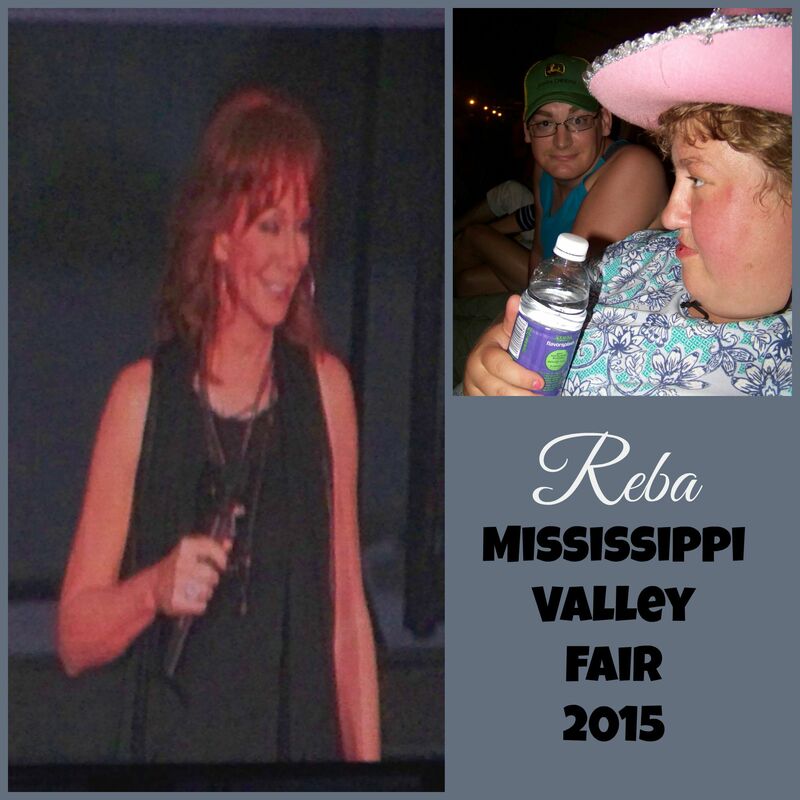 After Reba’s performance to 27,600 people, the din in the grandstand was astounding. Even after half the people were gone the sounds of all the voices and movement created an overall racket. We leisurely made our way to our car after wisely stopping at the restrooms. The sounds of the fair floated in our open car windows. In the distance was the music and squeals from the carnival rides and the dings and barker calls from the midway, farther away we could hear a train whistle blowing, and nearby were the shouts of frustrated concert goers who were trying to vacate the congested parking area. Horns were blaring, radios blasting, and girls dancing and singing on top of cars. I announced there was no hurry to leave, we would just wait in the car for awhile before entering the chaotic web of exiting cars. Katie was resting her head against the back passenger seat for a short time when she stated, “It is so peaceful here.” Merely a moment passed before she burst into laughter and added with lots of chuckling, “Well, compared to in there.”, as she pointed to the grandstand we had left behind. Perspective folks…..Life is all about perspective.